Laparoscopic Totally Extraperitoneal Preperitoneal (tepp) Inguinal Hernia Repair Using Fetal Bovine Dermal Tissue (surgimend). Laparoscopic preperitoneal hernia repair is a viable option for the repair of initial and recurrent inguinal hernias. It is particularly appealing for the treatment of recurrent or bilateral inguinal hernias. Since the technique of laparoscopic inguinal hernia repair was first described in 1989 by Schultz, Graber and Pietrafitta, it has undergone a number of modifications. The procedure can be performed either through a totally extraperitoneal (TEPP) approach or a transabdominal extraperitoneal (TAPP) approach. Laparoscopic inguinal hernia repair has been performed using non-absorbable permanent prosthetic materials. These materials are able to produce a strong permanent barrier to recurrence but can be associated with a number of problems including pain and infection. In this study a TEPP repair was performed using fetaldermal tissuewith a nominal thickness of 0.8-1.2 mm (SurgiMend), TEI Biosciences, Boston, MA). The repairs were performed through a 2 or 3 puncture technique. An infraumbilical incision was made for baloon dissection and Hassan cannula placement. One or 2 additional midline 5 mm trocars were placed as working ports. The number of 5 mm ports placed depended on anatomy, ease of dissection and ability to handle the material. The material was secured to pubic bone, coopers ligament and anteriorly and laterally to muscle using a spiral tacker. This was a single surgeon study. All procedures were performed under general anesthesia. A total of 35 hernias were repaired in 26 patients between 10/15/08 and 8/4/09. There were 24 males and 2 females. Fifteen patients had unilateral and ten patients had bilateral inguinal hernia repairs. There were 26 indirect and 9 direct inguinal hernias. One of the indirect inguinal hernias and 1 of the direct inguinal hernias that were repaired were recurrent. In 2 patients with unilateral laparoscopic hernia repair a hernia was detected laparoscopically on the opposite side. These 2 hernias could not be repaired laparoscopically for technical reasons. In 1 of these 2 patients the opposite side was repaired using an open technique at the same time as the laparoscopic repair. The time required to perform unilateral laparoscopic inguinal hernia repair ranged from 22-85 minutes with an average of 39 minutes. The time required to perform bilateral laparoscopic inguinal hernia repair ranged from 39-74 minutes with an average of 52 minutes. There were no intra operative complications. There were no technical failures or acute recurrences. Follow up ranged from 2 to 11.5 months with an average of 7.2 months. There were no post operative wound infections. In one patient a post operative seroma developed. It was not treated. That patient subsequently developed a recurrence at 4 months. There were no other recurrences. 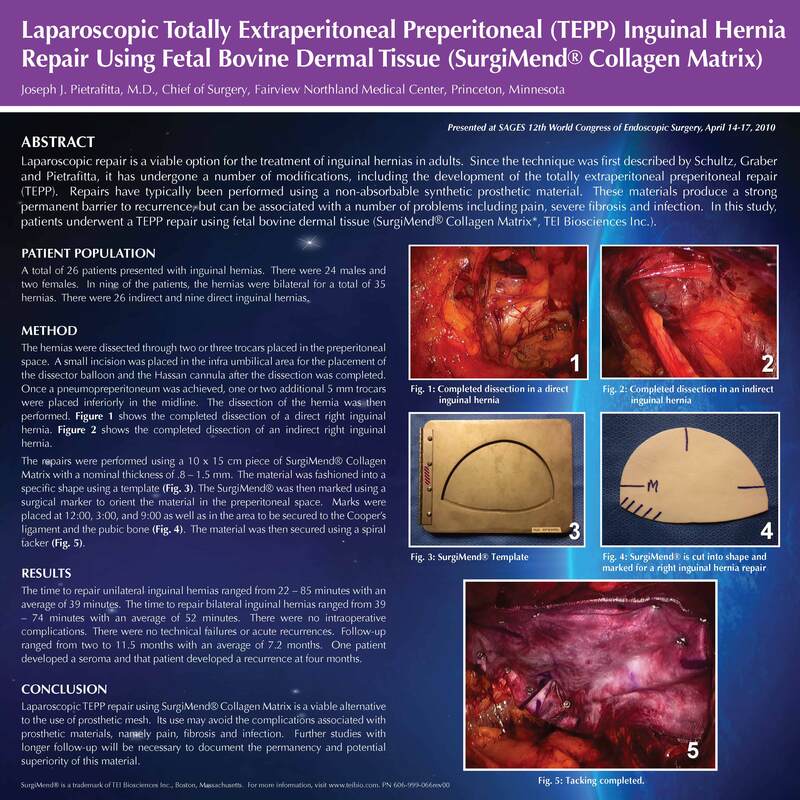 Laparoscopic TEPP repair for initial or recurrent inguinal hernia using a biological material made from fetal calf skin appears to be a viable alternative to the use of a non absorbable permanent prosthetic material and may avoid some of the complications associated with the use of these materials. Larger studies with longer follow up will be necessary to document the permanency and potential superiority of these newer biological materials.